These are used in good condition with good tread remaining. They will be received in the condition they were taken off, dirty. Set of (4) - 18x8.50-8 Kenda Hole-n-one Tires. Kenda, Sawtooth Hole-n-1. No Lift Kit Required. NOTE: This is a set of 4 tires only. Tires and wheels specifications. Offset (IN). STEELENG 8” black steel wheel. (Made by STEELENG). 2.5(back) 4.5(front). Tire details information is provided by Wanda manufacture. Bolt Pattern. Weight (lbs). 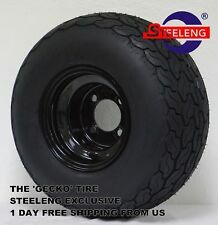 STEELENG GECKO tire. Tires and wheels specifications. Offset (IN). STEELENG 8” black steel wheel. (Made by STEELENG). Tire details information is provided by Wanda manufacture. Bolt Pattern. Weight (lbs). Pictured is an EZGO valor with them on it. 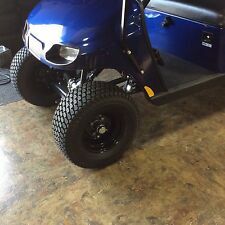 These will fit an EZGO RXV with no lift. Easy on the grass! Wheel offset 3 4. Bolt Pattern 4x4. These Alloy Wheels fit the standard 4x4 bolt pattern for E-Z-GO, Club Car, Yamaha, Star, etc. PRICE IS FOR SET OF FOUR Lug Nuts NOT included. Tires have a Unique Modern style tread design. No lift required. 3 4 Offset. 8x7 centered white steel wheel. Tire Features & Specifications Mounted and ready to install. Wheel Features & Specifications. (E-Z-GO TXT and RXV.). Standard 4x4 Golf bolt pattern. Tires are 20" tall and 10" wide. This DURO tire has a UNIQUE MODERN TREAD pattern. (EZ-GO, Club Car, Yamaha, Star, Columbia, etc). Item number 131413808785. Item number 162370162928. California Prop 65 - This product can expose you to certain chemicals, which are known to the State of California to cause cancer or birth defects or other reproductive harm. Max Load: 515lbs. Our team works hard to find you the best deals and provide you with a wide selection of products. Excel, All-Terrain Sahara Classic. Set of (4) - 18x9.50-8 Sahara Classic All Terrain Tire. Note: Set of 4 Tires Only, does not include wheels. Directional Tread. STEELENG 12” LIGHTSIDE aluminum wheel. (Made by STEELENG). Tires and wheels specifications. STEELENG low profile tire. (Made by Wanda). Tread Depth. EZGO: TXT / ST / PDS / RXV (07-Newer) -without lift kit. 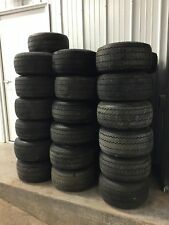 SET OF FOUR 18x8.50-8 Golf Cart Tires 4 PLY 18x850-8 FREE SHIPPING,SALE! This tire has a classic sawtooth tread pattern. (EZ-GO, Club Car, Yamaha, Star,Columbia, etc). Factory lug nuts can still be used if needed. 8x7" 2:5 Offset Solid Wheel. 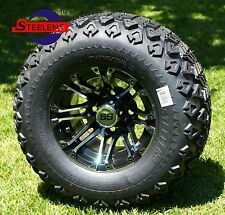 Set of (4) 8x7 Black Steel Wheel mounted with 22x11-8 Sahara Classic Tires. Matte Black Finish. It is used in good condition with good tread remaining. It will be received in the condition when it was taken off, dirty. STEELENG 12” MACHINED/BLACK PREDATOR aluminum wheel. (Made by STEELENG). Tires and wheels specifications. Offset (IN). 23"x10.5"-12. 3(back) 4(front). FREE Trial! Tire details information is provided by Wanda manufacture. Each tire has been designed to provide traction without excessive wear and tear. Tires only. Wheels not included. 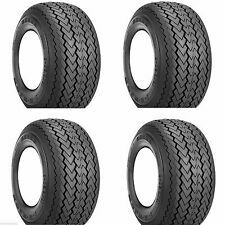 SET of FOUR 205/30-14 Cruze Golf Cart Tires - FREE SHIPPING!! Tires only. Wheel not included. Set of (4) - 20x10.00-10 Excel Sahara Classic All Terrain Tires. Excel, Sahara Classic. NOTE: This is a set of 4 tires only. STEELENG 14” BLACKNIGHT STALKER aluminum wheel. (Made by STEELENG). 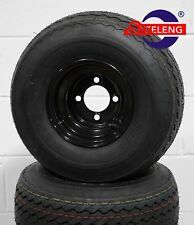 STEELENG STINGER All-terrain tire. (EXCLUSIVE). 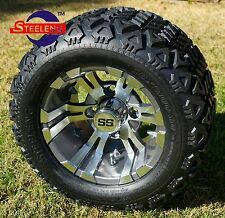 STEELENG designed 'STINGER' all terrain tires. (DOT RATED). Tires and wheels specifications. Set of (4) - 23x10.5-12 GTW Recon A/T Tire (Lift Required). GTW Recon all terrain tire. Each tire has been designed to provide traction without excessive wear and tear. Lift Kit Required. Note: Set of 4 Tires Only.